In a distant future in which Latin Americans have pioneered faster-than-light space travel, Dr. Jan Amos Sangan Dongo has a job with large and unusual responsibilities: he’s a veterinarian who specializes in treating enormous alien animals. Mountain-sized amoebas, multisex species with bizarre reproductive processes, razor-nailed, carnivorous humanoid hunters: Dr. Sangan has seen it all. When a colonial conflict threatens the fragile peace between the galaxy’s seven intelligent species, he must embark on a daring mission through the insides of a gigantic creature and find two swallowed ambassadors—who also happen to be his competing love interests. 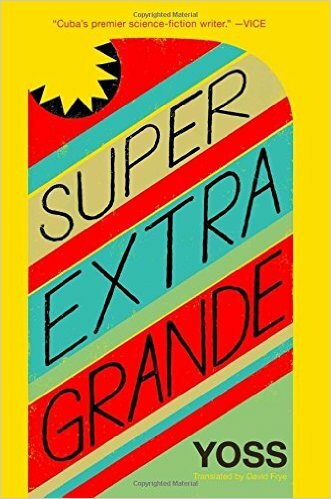 Funny, witty, raunchy, and irrepressibly vivacious, Super Extra Grande is a rare specimen in the richly parodic tradition of Cuban science fiction, and could only have been written by a Cuban heavy-metal rock star with a biology degree: the inimitable Yoss. Born José Miguel Sánchez Gómez, Yoss assumed his pen name in 1988, when he won the Premio David in the science fiction category for his novel Timshel. Together with his peculiar pseudonym, the author's aesthetic of an impentinent rocker has allowed him to stand out amongst his fellow Cuban writers. Earning a degree in Biology in 1991, he went on to graduate from the first ever course on Narrative Techniques at the Onelio Jorge Cardoso Center of Literary Training in 1999. Today, Yoss writes both realistic and science fiction works. Alongside these novels, the author produces essays, reviews, and compilations, and actively promotes the Cuban science fiction literary workshops, Espiral and Espacio Abierto.